Cardiff Devils' Matt Pope knocks the net off it's moorings in Sheffield. Pic: Dean Woolley. 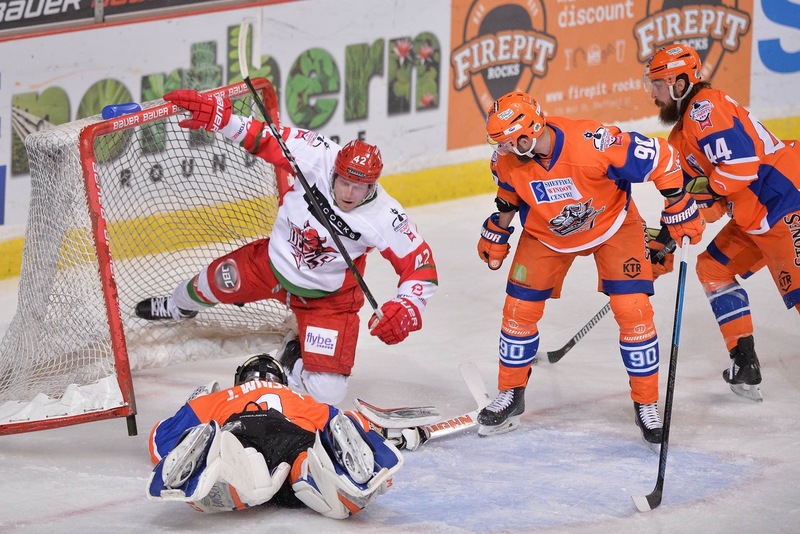 Cardiff Devils and Sheffield Steelers clash in what is certain to be an intense, physical play-offs match at the Viola Arena in Cardiff Bay this evening. A major turning point came when James Livingston was thrown out on a spearing call and that gave Steelers a five minute powerplay during which they scored twice and then added a shorthanded fifth. “If anyone knows our team well enough, we’re going to keep going no matter what,” said Lord. “That’s what we showed in Sheffield. We have to keep going until we can’t go any more. “It was an intense game with both teams playing physical around the nets, putting their bodies on the line hitting and blocking shots. Steelers coach Tom Barrasso said: “The most important thing tonight is our start. “We have to be ready to go from the off because Cardiff come hard at you in their own building. Sean Bentivoglio and Robert Dowd battle for puck possession in Sheffield. The game is being shown live on FreeSports with Aaron Murphy and Paul Adey commentating. Cardiff will be confident, having scored 20 goals in three games at home against Sheffield this season. Nottingham and Fife prepare for a ‘winner takes all’ second leg battle at the Motorpoint Arena. “A one-off game with all to play for,” said Fife coach Todd Dutiaume. Coventry have the biggest task of the return legs..
“Belfast were better than us in all areas – not that we were awful, but we didn’t match their elevated game,” said Blaze coach Danny Stewart. Cardiff Devils forward Stephen Dixon faces off with Steeler forward John Armstrong. Pic: Dean Woolley. Glasgow need to end a four-game home losing streak if they’re to make it through to finals weekend. Over those defeats the Clan averaged giving up four goals per game, something they probably can’t afford to do against Flames. What happens if any of the quarter-finals are tied on aggregate after 120 minutes? If the scores are level on aggregate after 60 minutes tonight, there will be a five-minute, sudden-death overtime period played 3-on-3. If that fails to produce a winner, the teams will contest a best-of-five shootout. Should that not see a result either, the shootout will continue as sudden-death.